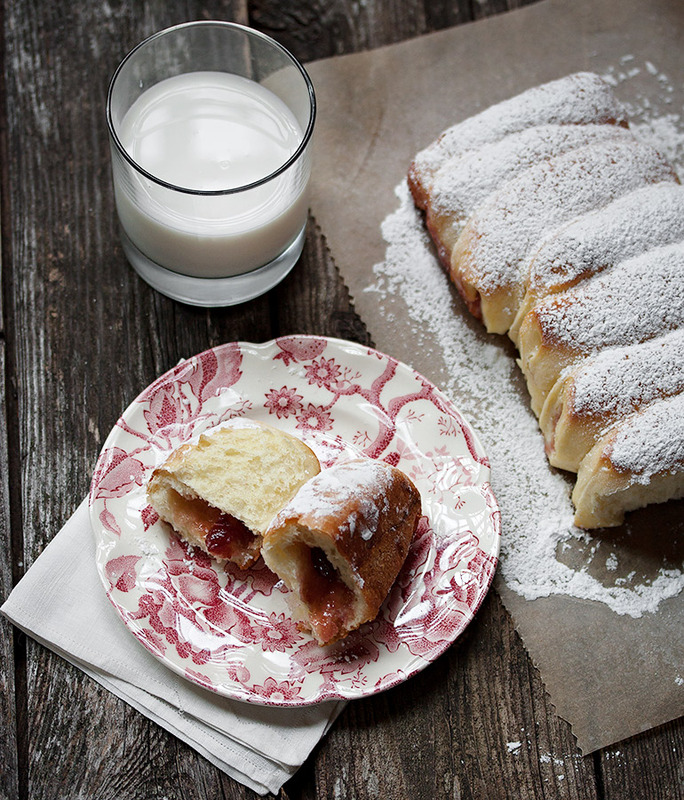 Jam-filled buns meet pull-apart bread! 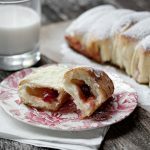 Filled with raspberry jam and baked up pull-apart style in a loaf pan. 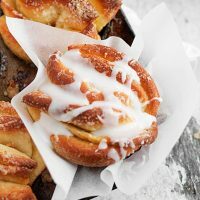 A while back, I came across an interesting recipe for jam-filled buns. 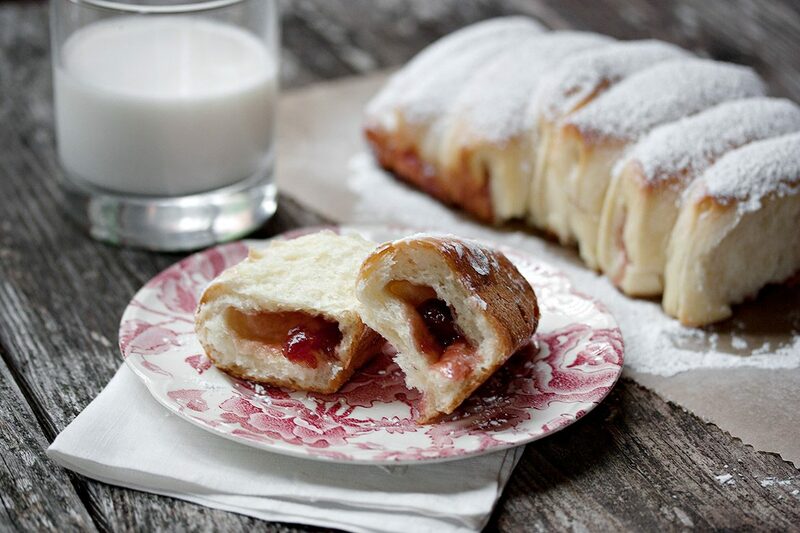 I learned that jam-filled buns are a traditional treat in Czechoslovakia, I believe, where they are called Buchty. Within the hour, I was in the kitchen whipping up a batch. That happens to me a lot. I loved them. All 40 of them (ok, I may have shared a few and it only seemed like I ate 40 buns). So I got to thinking that maybe a smaller batch was in order. Maybe in loaf-pan size. That I could pull-apart rather than bake in rows of buns. So I could enjoy more of that tender, flaky “inside” bread, like the kind you get when you pull apart dinner rolls that have been baked close together. 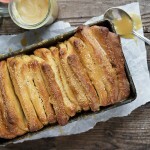 And then jam buns would meet pull-apart bread and it would be good. Very, very good. So this week, I finally had a chance to give it a try and it was everything I had imagined. 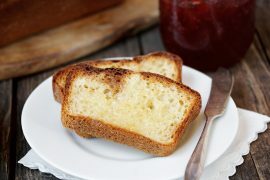 This recipe will make two loaves of 8 “buns”, so you could use a different kind of jam in each one, if you like. I have to tell you though, few jams can compete with raspberry in these buns (the cherry jam ones were surprisingly underwhelming). I recommend raspberry jam. Trust me. On first bite, I thought this bread was great, but that maybe the dough needed just a wee bit more sugar and salt. After the 3rd and 4th bite, I realized I was wrong. They were perfect just as they were. It was only my regular consumption of “Western” bread, that is well salted and often sweetened, that made this dough seem lacking at first. It was in fact, wonderfully light and a perfect compliment for the raspberry jam. And I guess that’s why raspberry jam works so perfectly. 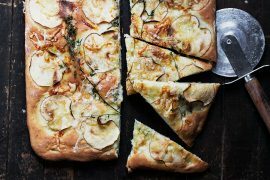 It’s so full of flavour that it is the perfect foil for the bread. You can use homemade or store-bought jam for these buns. The only tip I’d have is to make sure that whatever jam you use, it’s thick. These buns are a cinch to shape and the dough handles beautifully, but add runny jam to the mix and you’ll quickly have a bit of a mess. Don’t skimp on the icing sugar. It does add the sweet in such a lovely, jelly-donut kind of way. I powdered the whole loaf for my photos, but it’s probably best to powder each piece as your eat it or the entire loaf just before serving. If your powder disappears as they sit, just add some more. This will make two loaves of 8 buns each. You can use a different jam for each loaf, if you like, but raspberry is fabulous in these, so I'd recommend that, or a similar high-flavour jam. Be sure to use a thick jam, whichever kind you use. I've included both metric and imperial measures. If you have a scale, go with the gram measurements for greater accuracy. In a small saucepan, heat the milk until steaming and small bubbles form around the edges (not quite to the boil). Remove from heat and let cook to lukewarm. Butter or spray two 9-inch by 5-inch loaf pans and set aside (you can use 8x4, if that's all you have. It will be a little tight lengthwise, but it should work). In the bowl of a stand mixer (or a large bowl), combine both flours, yeast, sugar, and salt. Add the lukewarm milk, eggs, vanilla, vegetable oil (and the orange zest, if using). Mix then knead by hand, or using your mixer. Mix until the dough is smooth but slightly sticky. Add more flour as needed. The more moist your dough is, the more tender your bread will be, so only add enough flour to bring the dough to a point where it can be kneaded (it should be moist, but shouldn't stick to your hands). Place the dough in an oiled bowl, cover with plastic wrap and let it rise in a warm place until doubled in size, about 1 hour. Turn the dough out onto a lightly floured surface and roll out into a rectangle about 16 inches by 16 inches. It should be about 1/2 inch thick. Using a pastry cutter, a pizza cutter, or a knife, cut the dough into 4-inch x 4-inch squares. You'll have 16 squares. Using your index finger, make a small indentation in the centre each square. Place about 1 tsp. of jam in the centre. (*Don't over-fill or you'll quickly have a jammy mess on your hands :) To shape, pick up each piece of dough and pinch the opposite sides together, until it's well sealed. Pinch the sides as well, making sure that all edges are sealed, or your jam will leak out as it cooks. The dough should be sticky enough so that it sticks together well. Note: if you'd like to use two different flavours of jam - one for each loaf - fill 8 rolls with one kind of jam and the other 8 with another kind. Repeat these steps until all rolls are made. Place 8 rolls side by side into one of the prepared loaf pans, with the seams down. Repeat with the other 8 rolls in the other pan. Cover loosely with plastic wrap and set to rise another 20-30 minutes. They will rise a bit more. Before putting in the oven, brush the rolls with an egg wash (1 well beaten egg). Bake them for about 22 - 25, until nice and golden brown and they sound hollow when tapped. Allow to cool for about 10 minutes in the pan, then run a knife around the edges and remove loaf to a cooling rack to cool completely. Once cooled, serve sprinkled with a generous amount of powdered sugar. Perfect for Spring, this one is filled with Maple Butter. These rolls are individual pull-aparts, baked in muffin tins. I just made this recipe right now. It is wonderful !! As matter fact, I did cheating kneading by hand instead, I did make by Bread machine. It came out so~~~~soft and very uncontrolling material ,but I just adding more flour and a little bit kneading by hands. After that, I did as same as your recipe followed , put Jam ( actually I using Strawberry Jam) on center and sealed and make double sized raised dough (this problem also fix because I was extending raised up dough time for 1.5 hours !! on bread proof oven , but nicely came out double size !! ) Any way, I was so satisfied after everything done and baked. First I was it is so make worry about dough was sticky and everywhere. But it is so delicious . Next time I ‘m going try to using typical American Favorite way to Strawberry and Peanuts butter. Thank you ! Hi Yuri. So glad you enjoyed the bread. You’ll want to always remember that the amount of flour is always just a “suggested” amount and never exact. Everyone’s flour has different amounts of humidity, depending on the type and where it is stored. So for every bread, you may need more or less than the recipe suggests. I just keep adding flour until the dough is the proper consistency, regardless of the recipe. After made this on next day, we are only 3 family members , so we couldn’t eat finishing them all for one day. Breads are getting hard, so I did sliced this bread and toasted with Peanut butter on it . It is sooooo good ! Hi! I’d Like to know why do you use cake flour, why is is diffent from all purpose flour? Thanks! I really want to try this recipe but I don’t have cake flour…. Hi Anada, Cake flour is lower protein (softer), so it helps to make a softer, lighter crumb. You can skip it and just use all-purpose (may need to tweak the amount a bit and your crumb won’t be quite as light), or you could “make your own” cake flour by measuring out the 1/2 cup amount but using all purpose flour. Remove 1 Tbsp. of the flour and replace with 1 Tbsp. of cornstarch. Sift together and use in the recipe. Hope that helps. Thank you!! I am trying it right now! :) Love from Veracruz, Mexico. If I had to pick 2 favorite ingredients they would be raspberries and bread. This reminds me of the fresh ones my dad used to pick for my morning breakfast. When I try this recipe I will surely remember him. Thank you! I agree, Jules. Raspberries and bread where meant to be together :) Enjoy! What a terrific recipe!!! 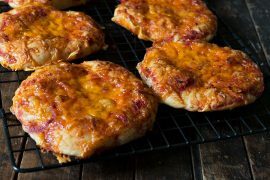 I need to break out the yeast and give these a try! This is the first time I make bread, and let me tell this is the bomb! Everybody in my house was crazy, I had to bake twice. One question, can I prepared the dough a day before? Glad you enjoyed it! I haven’t tried it, but I suspect you could refrigerate dough overnight, and let it rise slowly in there. In the morning, take out, shape and allow to do it’s second rise before baking (will take a bit longer as the dough is cold, so will need to warm up before it will start to rise again). If you try it, let me know how it works out. My grandma makes me butchy (or Kolaches) every christmas! This will definitely tide me over until then! I have one thing to say. WOW. These look so delicious. They remind me of a breakfast treat I used to have as a child. Your photos capture their beauty so well. Amazingly beautiful. Your work consistently amazes me. Thanks so much Heather. I appreciate your visits. Great blog, wonderful pictures. Love to follow you. I was wondering if you recommend using a specific type of milk? i.e. does fat content matter? What do you think about subbing in nondairy almond milk? Hi Stephanie, the bread is really light and fluffy. As for milk, I usually have whole milk around (3.5%), so that’s what I use. That said, I’d certainly give it a try with almond milk if you’re trying to avoid dairy. I imagine you could also just use water in place of the milk. I bake a lot of breads with just water as the liquid. If you try it, let me know how it worked.